There are many factors that contribute to a piece of clothing’s style quotient. Those factors could be fit, construction, color scheme, and a multitude of others. One factor that we also talk about often is uniqueness, or rarity. This isn’t to say that common pieces don’t look good, but rather that they just don’t stand out. Take, for example, the white dress shirt. Everyone looks good in one, but no one is going to turn heads wearing one. 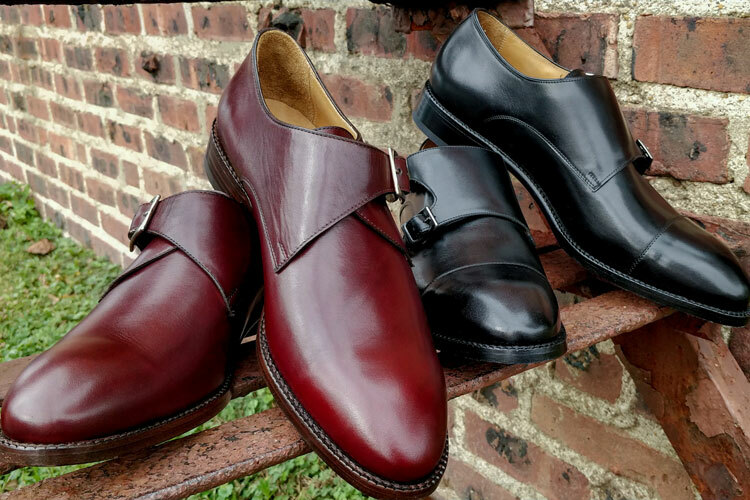 In the shoe world, wholecuts are one of those unique offerings that not many brands bother to make, let alone sell, despite their superior style. 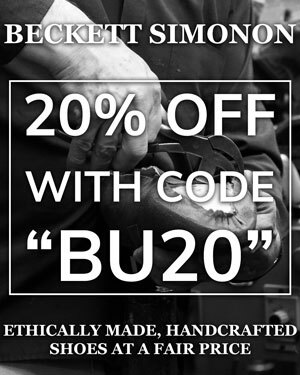 I had the good fortune to get my hands on a pair from Holden & Green, a new British shoe firm promising the quality of shoes made in Northampton, England, but at a fraction of the cost (as they are made in Asia). Generally, I think the shoes are great. I’m excited to share my review with you below! 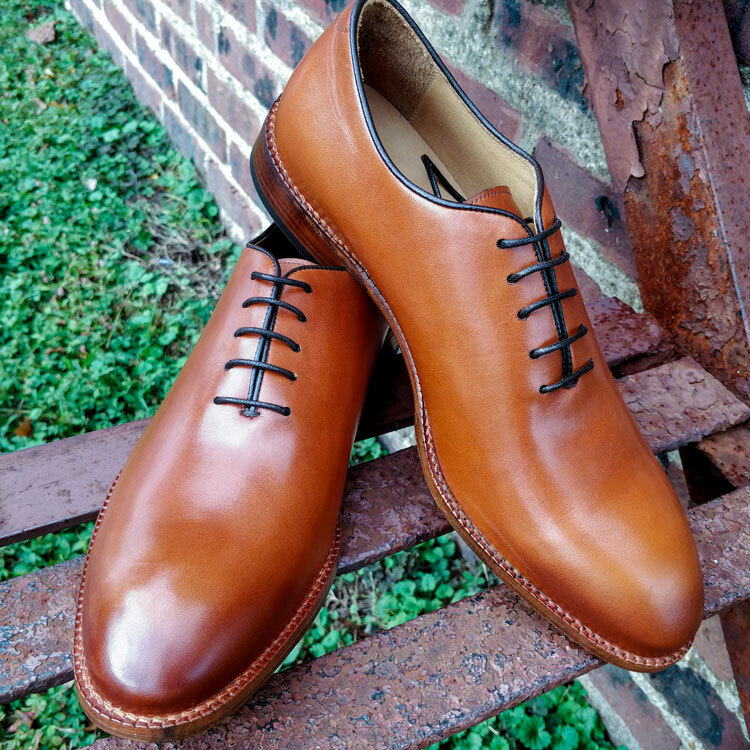 What Is A Wholecut Shoe? 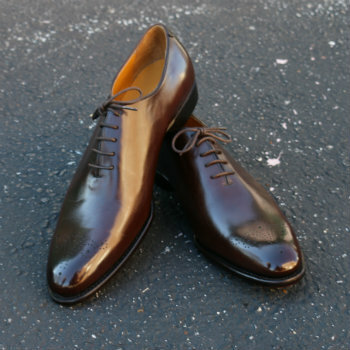 Wholecut shoes are a type of oxford wherein the upper is made from one solitary (that is, “whole”) piece of leather. 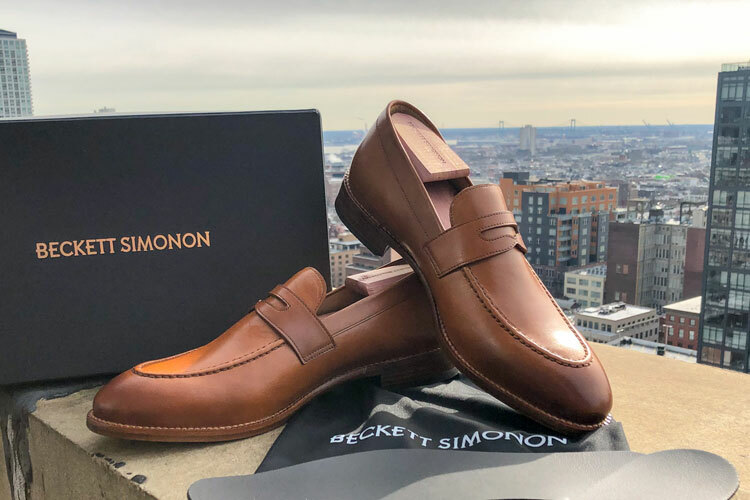 They are renowned for their cleanliness and difficulty to craft, the latter of which makes their price point typically higher than other in-class shoes. The preceding link will take you to our page dedicated specifically to this kind of shoe. 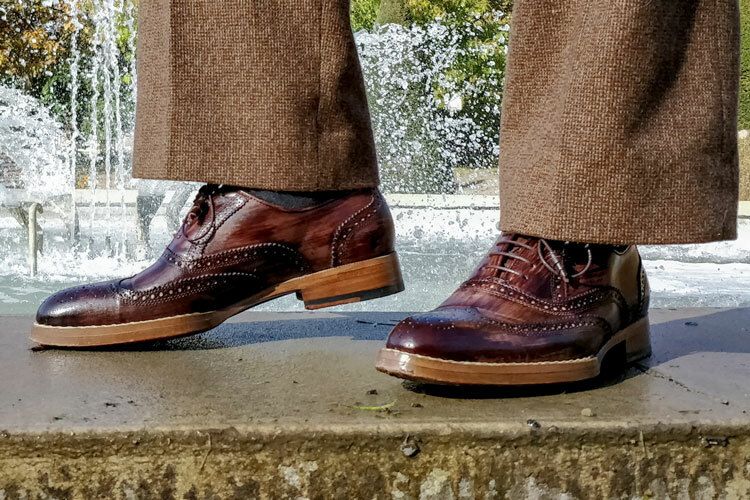 For plenty of information on every men’s shoe style, see our guide to shoe styles. The usual suspects were included in the box: shoes themselves, lots of packaging, and most importantly, individual flannel bags. These are hugely helpful for protecting your shoes and clothes while in transit, and they’re part of a comprehensive shoe storage solution that we’re big fans of: shoes in bags, then in their box. This all shows that Holden & Green has the long-term wear of their shoes in mind, and for shoes of this quality, that’s important. Holden & Green shoes are made with a Goodyear welt construction, meaning that they’ll be able to be resoled repeatedly for years to come. The leather on the uppers feels good in the hand, and more importantly, feels good on the foot. The shoe features a gentlemen’s cut on the heel, which serves to protect the trousers from ripping. 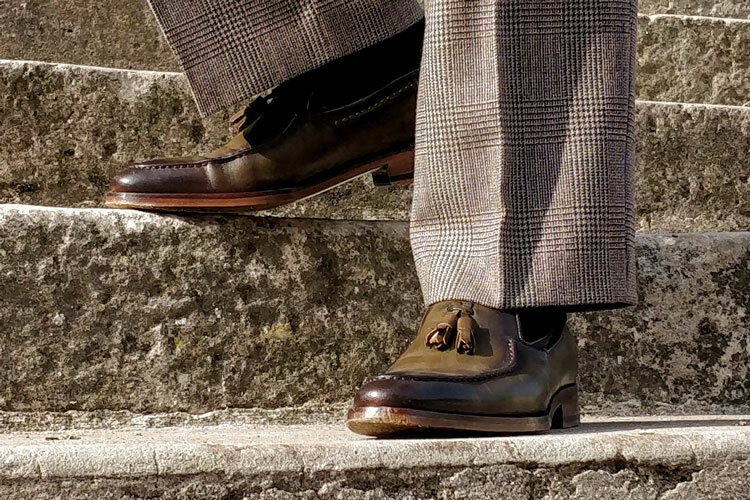 This detail isn’t technically necessary with today’s short-cut trousers, but it’s still nice to see as it’s a holdover from traditional shoe manufacturing techniques. Unfortunately, some of the color of the leather seemed to be flaking off a bit on both shoes. While this was minor and was easily remedied by a quick polish, I think it’s worth it to bring this to the manufacturer’s attention. Even though this kind of error only occurs maybe 2% of the time, it’s important to call it out when it happens. Always strive for perfection! These wholecuts have a tapered toe box with a handsome medallion on the toe. I like a bit of broguing on my shoes, especially in this very subtle way. It adds a little visual interest on an otherwise plain shoe, lending it style while not compromising formality. The red sole (pictured above) is an incredibly stylish detail, in my opinion. The last of these Holden & Green’s is tapered. In fact, it’s more tapered than I typically prefer (I’m more of a round toe kind of guy), but once I put these on, I loved how they looked. 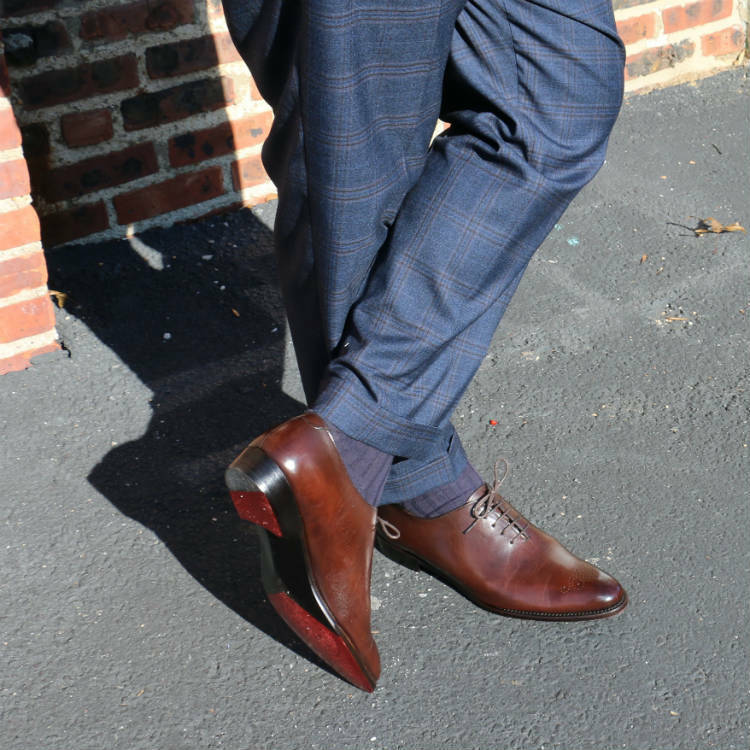 A tapered shoe adds height (something I don’t need at 6’4″), but its slimness makes the suit I wore it with look even sharper. But, more on that below. Having just picked up a suit from Indochino, I decided to have a bit of fun and pair these shoes with the waistcoat and trousers from that suit along with one of my Harris tweed jackets. This particular shade of brown looks stunning against the blue trousers. If you need some more information on the subject, check out our shoe-and-trouser coordination guide. Below, we can see some of the other details of the outfit: red lapel flower and tie by Dapper Lapel, Harris tweed jacket, blue paisley pocket square, and Indochino vest. These shoes proved to be comfortable, great-looking, well-constructed, and a fair price for the quality (approximately £350). The only issue was the small one of the color rubbing off, but again, this was easily rectified. I’m a big fan of these shoes!